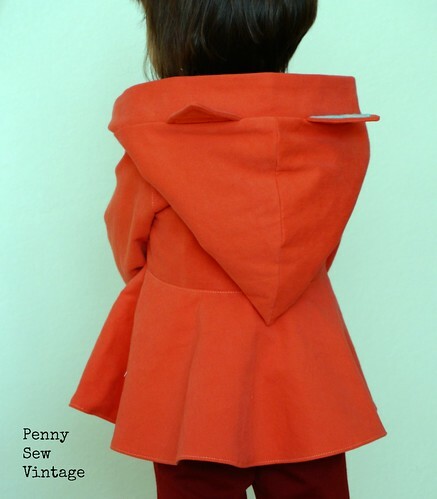 This was a really fun sewing project that I was so excited to make for my little one. 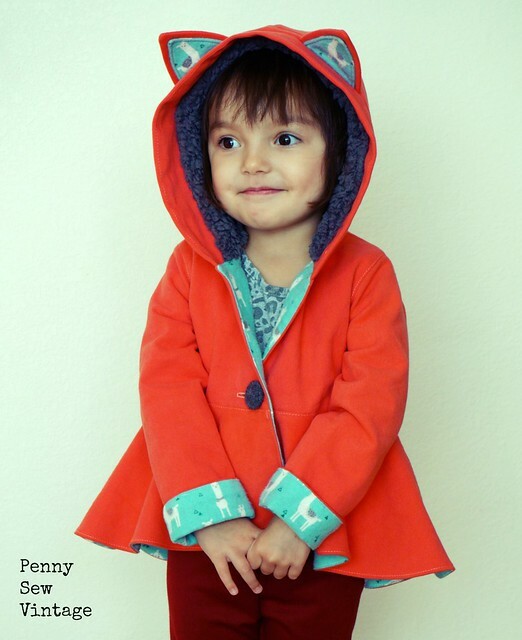 She really needed a raincoat, and I wanted something adorable and different that I wouldn’t need to buy everything for. 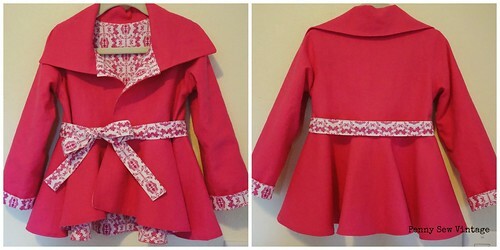 I’ve had the Bristol Reversible High Low Jacket pattern from Create Kids Couture for awhile. I used it to make my big girl her pink princess birthday jacket. It’s very cute and feminine with a high low circle skirt feature, and it’s a very quick sew. 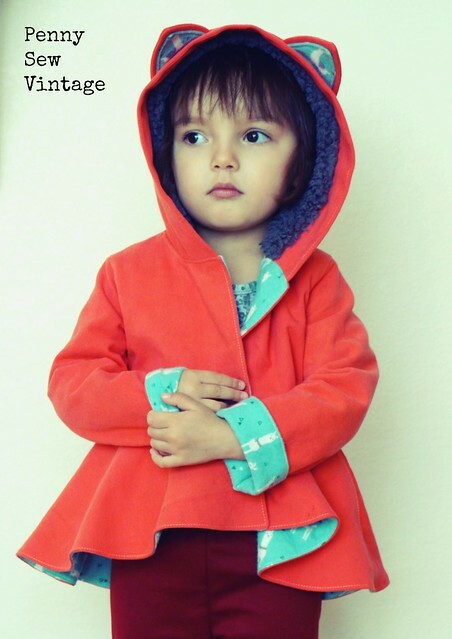 I combined it with the free Molly hood from Violette Field Threads. 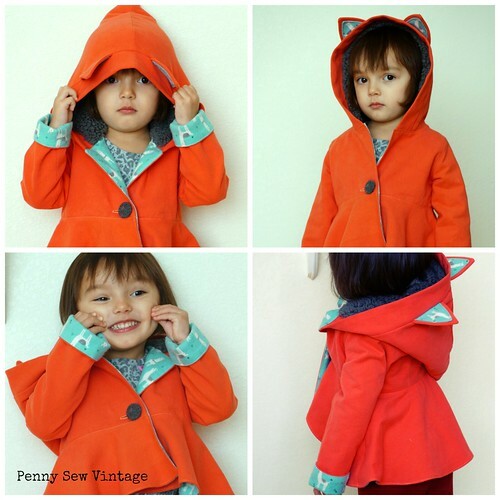 It’s a Molly Jacket add on that includes animal ears, and I was seriously tempted to just buy the Molly Jacket pattern, but I’m so glad I went with the Bristol instead. 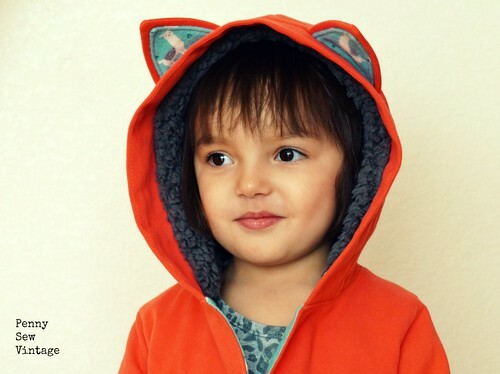 I combined the Bristol Jacket in size 3 and the Molly hood in a size 2 with the cat ears; I don’t think the size 3 hood would’ve fit the jacket. I decided to go with orange cotton twill for the jacket, flannel for the lining, and gray faux fur for the hood lining. Cotton twill is water resistant, and it’s easier for her to move around in than some of the plastic type or laminated raincoat materials. Plus it’s so much easier to sew with. The faux fur’s nap was pretty short, so I didn’t really have much issue sewing with it, much to my relief. I followed the instructions for the Bristol jacket, just replacing the collar piece with the previously assembled hood. The instructions for both patterns were very simple to follow. Since the sleeves are turned up at the bottom, I made sure my llamas were upside down on the sleeve lining pieces since they’re a directional print. I’m obviously not making this jacket reversible. Instead of using the tie to secure the jacket, I used a button, but I might add a second button to keep it a bit more closed up and snug. Overall I’m very happy with how it turned out, and with our California weather, it’s kept her dry. There’s enough room inside the jacket to wear over a sweater, and the faux fur lined hood keeps her head warm. She’s thrilled with it too! 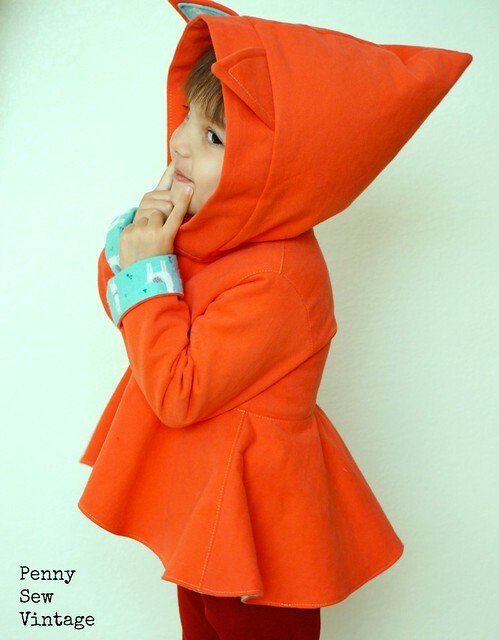 I really love the pixie hood as well which fits her little personality. I just love when pattern mashups work out. Have you thought about mushing together any patterns? It’s so much fun thinking them up and planning them!